THE Nissan X-Trail is the world’s best-selling SUV and is now on sale — and available with a range of upgrades which further enhance its quality and refinement. The changes include a distinctive and robust redesign of the exterior, a higher-quality interior with desirable new features, additional practicality for owners and innovative new technologies to make life on the road even safer. 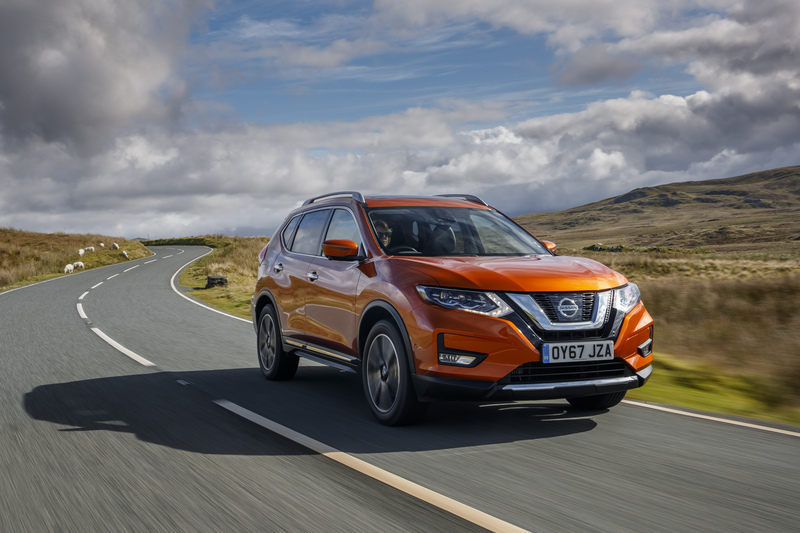 For drivers seeking new levels of flexibility and greater freedom when they want it, the new Nissan X-Trail, priced from £23,385 OTR, will be available with ProPILOT autonomous drive technology. The X-Trail is number one for Nissan. A highly capable five or seven-seat crossover aimed at adventure-loving families, it’s the brand’s best-selling vehicle worldwide. 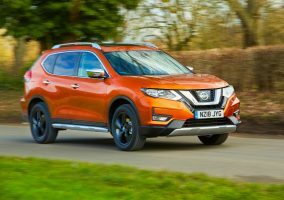 Including the USA, where the car is badged Rogue, more than 3.7 million have been sold since the first Nissan X-Trail was launched in 2000. That includes almost half a million cars in Europe, where the X-Trail remains hugely popular. Approximately 115,000 units have been sold in Europe since the all-new third-generation model was launched in 2014, and demand has grown significantly year on year; sales doubled from 2014 to 2015, and the total rose again by another 40% the following year. It is also a record-breaker. Including Rogue sales, in FY16 the X-Trail was the world’s most popular SUV, with 766,000 vehicles sold – more than any other rival model. The X-Trail has continued to evolve; in January 2016, Nissan launched the car with a new 2.0-litre 177PS diesel engine, broadening the range to meet the needs of consumers who require a higher-output powertrain. Not surprisingly, the Nissan X-Trail is a hit with its owners. The car has an outstanding 8.9 out of 10 customer rating with independent ratings organization, Reevoo. 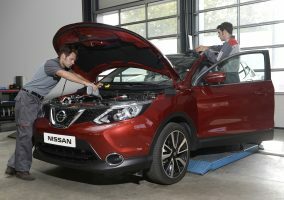 As with all Nissan vehicles, every upgrade – no matter how large or small – has been undertaken with the customer in mind. The result is the new X-Trail, featuring a distinctive and robust exterior design, higher-quality interior refinement, extra practicality for owners and innovative new technologies. The Nissan X-Trail has always been known for its sculpted and muscular styling, with chiseled lines, high wheel arches and elegant curves on the bonnet. All of those characteristics remain, and are now showcased through a distinctive and robust redesign of the front end, adding a new dynamism and more premium styling cues. On either side of the grille are new headlamp clusters, with much clearer design differentiation between the halogen units on Visia, Acenta and N-Connecta grades and full LEDs on Tekna. Both feature the latest version of the X-Trail’s ‘boomerang’ Daytime Running Light signature. For models with full LED lamps, dipped beam now features Adaptive Front Lighting System (AFS). This means dynamic cornering lamps operating in conjunction with the vehicle’s speed and steering inputs. Also appearing on the new Qashqai crossover, this is the first use of AFS for Nissan in Europe, and means greater illumination of a corner’s apex for better visibility and road safety. On high beam, the beam pattern is now wider than before, also improving visibility. The front fog lamps have evolved. Cleverly integrated into the new front bumper, they have changed from a round shape to a rectangular one. They are standard from Acenta grade. Also revised are the front parking sensors. Previously they were integrated into the bumper but did not sit completely flush to the surface. Now they are flush. The difference is small but significant, perfectly illustrating the car’s higher-quality finish and Nissan’s attention to detail. At the rear of the new X-Trail, the bumper has been redesigned to give it a more robust look with new chrome detailing. The rear lamp signature has been upgraded to become full LED, while the parking sensors are improved, as at the front of the car. The biggest change to the profile of the new X-Trail is the addition of a chrome side moulding across the base of the two doors. Creating a more dynamic appearance, this is standard on Tekna grade. There’s also a new 18” alloy wheel available on N-Connecta grade. The upgrades have resulted in a very slight change to the overall length of the car – an increase of 50mm means it’s now 4,690mm from bumper to bumper. There is no change to the new X-Trail’s width (1,830mm), height (1,710mm on Visia and Acenta, 1,740mm on N-Connecta and Tekna) or wheelbase (2,705mm). The exterior changes have not affected the new X-Trail’s aerodynamic performance, with a Cd rating of 0.32. The cabin of the new Nissan X-Trail boasts a raft of upgrades to enhance the existing high-quality feel. Entering the car, the striking new steering wheel is the first thing drivers will notice. It echoes the design of Nissan’s newest models globally and is standard across the X-Trail range. Now D-shaped, the horizontal base means easier entry and exit for the driver, as well as providing a sportier look and feel. The rim’s width has been widened – from 34mm to 37.5mm – to provide a more comfortable and safer grip. A new premium style comes from the satin silver detailing on the central spoke, which echoes the shape of the car’s iconic ‘V-motion’ front grille. A new feature is integrated heating, which is standard on Tekna grade. Heated seats for both front and rear occupants (not third row) are new, and standard on Tekna grade. For customers seeking something different, a new Premium Tan and black two-tone leather interior is available as an optional extra on Tekna. Other cabin upgrades add to the higher-quality ambience and increased refinement of the new X-Trail. A new leather knee pad on both sides of the centre console has been added, while the area above the glovebox has been given a more contemporary finish. The air vents now feature a new gloss black surface. The new X-Trail has a redesigned central armrest storage area and models with the XTronic automatic transmission, the gear selector has been restyled and features a new leather-style gaiter. The interior practicality of the new X-Trail makes it perfect for adventurous families. It continues to offers exceptional space and comfort, including best-in-class knee room in the second row of seats. It has clever storage solutions and practical features, such as the sliding/reclining functionality of the second row seats. On seven-seat versions, which make up 50% of the sales mix in the UK, access to the roomy third row is simple and convenient. The two highest grades of X-Trail have previously come with an electric tailgate as standard. This feature has been enhanced on new X-Trail with the additional of hands-free functionality. Customers with shopping bags or holding young children close by can now kick their foot under the centre of the car’s rear bumper to automatically activate the opening mechanism. The boot on the new X-Trail is larger than before. Thanks to improved packaging, VDA capacity is up from 550 litres to 565 litres on the five-seat version with all seats in place. Capacity on seven-seat interiors (445 litres) remains unchanged. Total space with all seats folded flat increases to 1,996 litres. Every X-Trail boot comes with Nissan’s innovative Flexible Luggage Board System, which allows for shelves and dividers to be adjusted in any one of nine configurations. These include a hidden compartment to keep valuables out of sight, making it the ideal base for family days out. Reflecting customer demands for a superior audio option in the new X-Trail, Tekna grade is now fitted with an all-new eight-speaker system as standard. 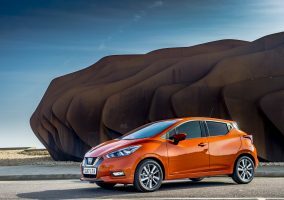 Supplied by BOSE, Nissan’s premium audio partner, it features two 25mm tweeters at the base of the windscreen, a 165mm woofer in each front door and a 130mm mid-range speaker in each rear door. Two 115mm woofers are housed in a 7.7-litre custom-engineered enclosure mounted in the spare wheel well. A BOSE digital amplifier with eight channels of custom equalisation and digital signal processing is mounted under the passenger seat (5 seat versions only). The system has been fine-tuned for X-Trail, resulting in the most complete sound system ever offered in a Nissan Europe vehicle. The BOSE Premium system creates a wider soundscape for a concert-like listening experience, with clarity of acoustics and minimal distortion at higher volumes. Customer feedback has led to improvements in the X-Trail’s two other infotainment systems. DAB digital radio is standard for the first time, while the NissanConnect touch-screen satellite navigation unit (standard from N-Connecta,) features a smart new user interface that’s more app-like in appearance. Where the NissanConnect system is fitted, the new X-Trail now features a ‘shark fin’ roof antenna for improved reception and a more contemporary finish. Nissan Intelligent Mobility is the name for the brand’s advanced technologies, which make its cars more desirable by redefining how they are driven, powered and integrated into society. The goal is to make Nissan drivers feel more confident, excited and connected, while also enhancing road safety. Nissan will introduce ProPILOT on the new X-Trail. It’s the first stage on the brand’s journey to autonomous driving, giving drivers more freedom by allowing them to automate the mundane elements of their motoring life. New Nissan Intelligent Mobility technologies have been added to the X-Trail. Rear Cross Traffic Alert, to mitigate the risk of low-speed impacts when reversing out of a parking space, is now available for the first time. If the driver attempts to reverse when an approaching vehicle is detected, the system gives visual and audible warnings. Intelligent Emergency Braking has been on the X-Trail since 2014, but has now been upgraded with Pedestrian Recognition. This innovative technology helps to minimise collisions with pedestrians using a combination of forward-facing radar and camera. New to the X-Trail is a technology called Stand Still Assist (SSA), which supplements Hill Start Assist (HSA) on cars with a manual transmission. SSA holds the car in a stationary position for up to three minutes, after which time the parking brake is automatically activated. SSA works on inclines, declines and on the flat, allowing the driver to take their foot off the brake. This improves safety, boosts driver confidence and reduces fatigue. A green light on the instrument cluster indicates when it’s activated. The X-Trail continues to be offered with numerous other safety technologies including Traffic Sign Recognition, Intelligent Driver Alertness, Intelligent Park Assist, Intelligent Around View Monitor and Lane Departure Warning. These technologies increase customer’s confidence and trust in their car, making it the new X-Trail the perfect car for family adventures. The new X-Trail maintains its 2014 five-star Euro NCAP safety rating. Confident drive is what Nissan calls a common product attribute – something that’s engineered into all vehicles around the world. It means a smooth and refined feeling on the road, with precise and stress-free steering and handling. It’s measured and benchmarked in three scenarios – on motorways, on country roads and in the urban environment. The confident driving characteristics of the Nissan X-Trail have been carried over to the new model, providing customers with predictable and safe performance for the life of the vehicle. The range of three efficient engines also remains, including the 2.0-litre 177PS diesel launched in 2017. It means customers have the choice of petrol or high and low-powered diesel, six-speed manual or XTronic automatic transmissions, and two or four-wheel drive to meet every type of customer need. Every new Nissan X-Trail comes with six airbags as standard, plus driver assistance systems including anti-lock brakes and stability control. Other standard equipment includes cruise control with speed limiter, Bluetooth connectivity, manual air-conditioning, electric folding / heated door mirrors and alloy wheels. Depending on the grade chosen, other available features include an opening panoramic sunroof, leather upholstery, privacy glass, dual-zone automatic air-conditioning and roof rails. Additional options include exterior styling plates and side styling bars. Genuine Nissan accessories include the roof bars, a fixed towbar with electric hook-up and a Paw Pack designed to make the X-Trail the ultimate car for canine adventures which comprises of a dog guard, ramp, dog bed, non-spill water bowl, boot liner and accessory tidy. Equipment levels on the new X-Trail vary across European markets, so please refer to local Nissan communications representatives for exact details.